Mate Precision Tooling, Anoka, MN, has published a 28-pg. catalog featuring Salvagnini-style Type II and Type III tooling, as well as Type 70 and 90 tooling, fully guided assemblies and PU and PB forming assemblies. Punches are manufactured from premium powdered-metal-based high-speed steel, boasting high abrasion resistance, anti-galling properties and hot and red hardness. Perforating strippers are fully guided, supporting the punch point throughout the punching cycle. 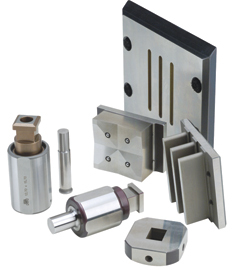 And, dies are of high-speed tool steel with Mate’s Slug Free dies available as an option for Type III stations. Last but not least—fabricators can order special Salvagnini assemblies for Type III tooling for slitting, shearing, multiple parts on sheet and tabbing, as well as for threadforming, louvering, beading, embossing and stamping.